My equipment, past, present and future. My first “big” ‘scope, the Tasco 11TR (the Bloody Red Baron). It was 114mm Netownian reflector on a equatorial mount with slow motion controls. It sported massive .965″ eyepieces (standard for the day but now reserved for drugstore telescopes) and was just about the best thing in the world to me when I opened that Christmas present in 1993. As you can see, it was not a very expensive undertaking. But it was nerve wracking and actually quite fun at the same time. I was really impressed with how well it all came together in the end. The before-after performance was amazing. I think it worked better than when it was new. I tweaked a few things and added flocking to the tube, so that may have helped. For a detailed write-up on the rehab process please read the thread I started on Cloudy Night’s telescope forums. I ended up selling the Black Knight (can’t be the Red Baron anymore, huh?) to a co-worker a year or so later to raise money (and save space) for the Yard Cannon (see below). It was hard to let go, but I know it went to a good home. This little wonder I nicknamed the Walmart Special. I had been reading the Cloudy Night forums one day in February of 2008 and there was a thread put out how Walmart had made some drastic mistake—they had purchased waaaaay too many telescopes for Christmas 2007 and had to deep clearance them all to save space, country-wide—and a telescope that normally went for $90-$110 was selling for $15-$20. So I had to try and find one. 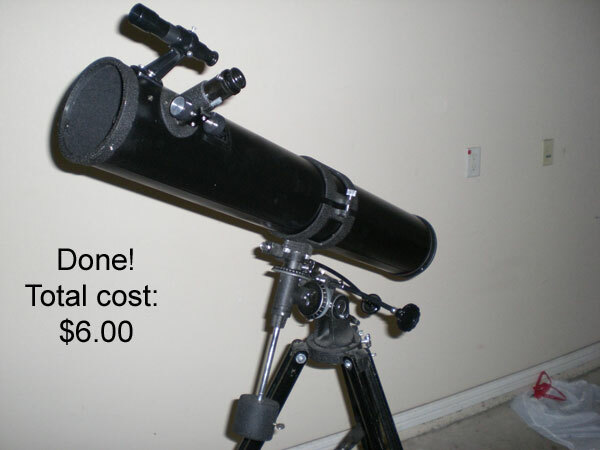 After seeing all the initial successes people were having all over the country in snapping up this great deal—it actually was a fairly decent little telescope!—I went to every Walmart in the Dallas-Fort Worth metroplex on my day off and finally found one. The last one in DFW if the clerk told me true. Was price: $99. Now price: $19.99. Not a bad deal. It was a little 70mm refracting telescope, mostly plastic, but the optics were pretty good. It had 1.25″ eyepieces (shaming the Red Baron/Black Knight) which were a huge improvement over the old .965″. I fell in love with the larger eyepieces and have never looked back (I don’t think they make that size anymore so there was no need to look back). It came with a decently sturdy little aluminum mount—and I do mean little. It was more of a tabletop model than a stand alone telescope. Well…for a kid I guess it would have work, but I would have had to kneel on the ground to use the tripod as is. So, I modified it. 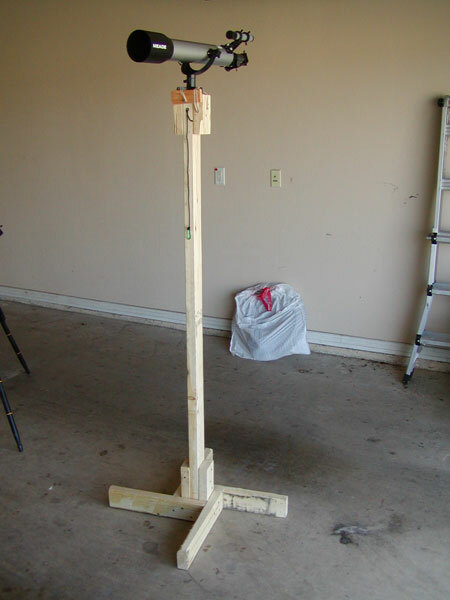 I took the telescope off the mount and made a portable pillar using 2x4s and brought the telescope up to about 6 feet. I’m 6’2″ so this was much more comfortable. 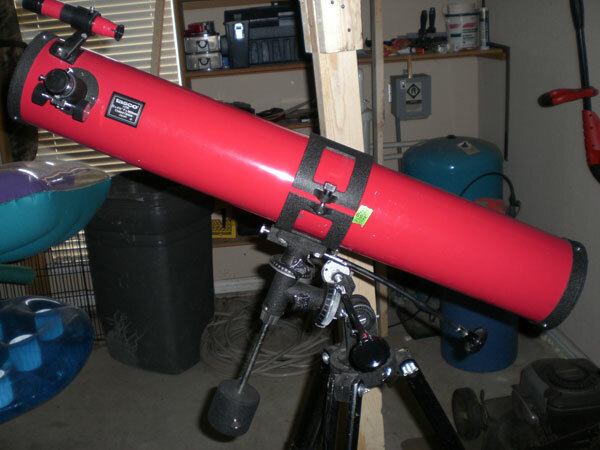 My job had me standing most of the day so I have always been more comfortable standing at a telescope (see below in how I modded the Yard Cannon because of this). It was decent, but it was more of an experimental scope than anything. I used it to compare views between reflectors and refractors, try out eyepiece/filter cominations, that sort of thing. It was extremely easy to set up and got a lot of use on the back deck in Texas. In fact, it gave me my first view of the Orion Nebula at half time during the Superbowl in 2009. But, we recently moved from a rental house to our own house here in Wisconsin and the telescope hadn’t been used in about 2 years. It was time to part ways. I sold it at a garage sale to a gentleman hoping to start his young daughter on the path of astronomy. Another scope goes to a good home! This little gem belonged to my father. In the mid-80s he got this and showed me Saturn for the first time. I will never forget that chilly autumn night when I stood next to dad on the front porch at our house on the hill (second highest hill in the state of Delaware, thank you very much!) and looked out over the valley at what I thought was a star. When I stepped behind the eyepiece—it was Saturn! I clearly saw the rings and some cloud bands…it blew my mind. That night started me on a lifelong journey through the heavens. Dad gave it to me around the time I left for college and I’ve had it with me ever since. I got to show my son the transit of Venus with this little guy. The little scope that could is my solar observatory! I love this little telescope. It’s only 60mm, so it’s pretty small by any standards, but it is very well built—all metal—and the optics are top notch. It is only .965″ for the eyepieces, but I can overlook that now that I have a .965-1.25″ adapter! Awww yeah. The Texas Yard Cannon. My pride and joy. This thing dwarfs the Red Baron/Black Knight as the biggest telescope I’ve owned, coming in at a whopping 8″ in diameter and nearly 4′ long. It uses 1.25″ and 2″ eyepieces and comes equipped with a cooling fan for the primary mirror. 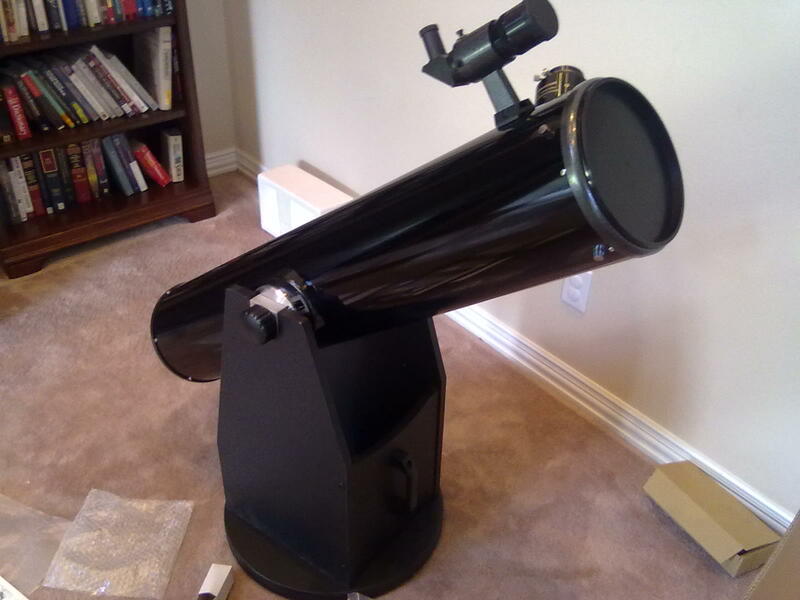 This thing is slick and I got it for a steal (with free shipping) from Telescopes.com, and I cannot more highly recommend them if you’re in the market for a telescope or accessories. They were the best priced—by far!—threw in the most goodies, had free shipping and everything was delivered in a week. 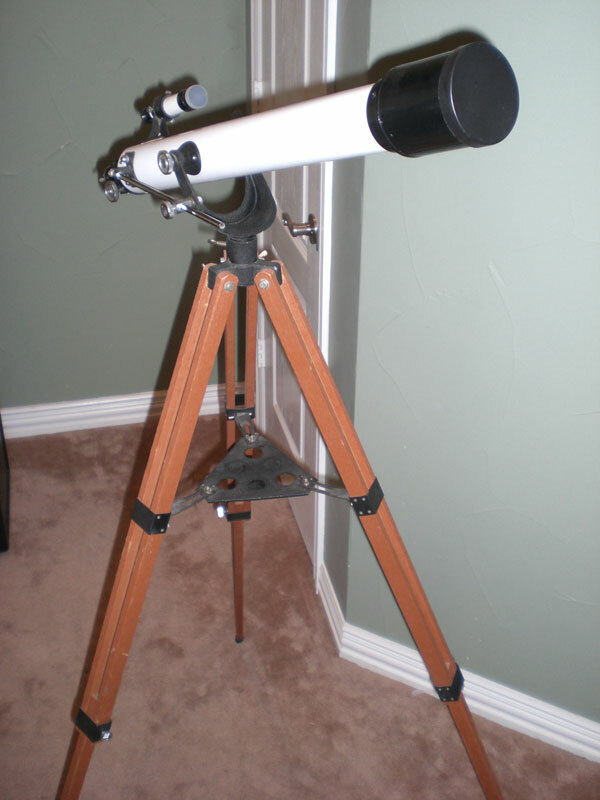 If you read this blog more than once, you’re going to see the TYCO mentioned a lot as it is my primary telescope until I get my life ‘scope (below). I have seen my first galaxy (Andromeda) with the it, as well as the ISS (yes, for a fleeting moment, I was able to manually track the space station as it raced overhead. And let me say…WOW was that cool to see), and all the planets except Pluto (yes, I am old school, Pluto is still a planet to me). It was in pieces in storage for the better part of a year while we made the 1,000 transition from Texas to Wisconsin last year, but now it’s safely ensconced in it’s new home and is ready for first light (again). Yes, there’s only one, because I am very happy with the TYCO and see it lasting a long, long time. But…I’ve always wanted a GOTO tracking telescope. The ability to just observe without constant nudging and trying to chase objects around the sky is a dream of mine. They’re expensive, but one day…oh yes, one day I will have one. I call it my mid-life crisis scope. Most guys use the mid-life crisis as a female-accepted reason for doing something (a) incredibly stupid/foolish, (b) something incredibly expensive, or (3) a combo of (a) and (b), all in the vain attempt to win back part of their youth in the face of the realization of ones own mortality. Or something like that. You hear the typical stories of men who buy things like motorcycles or $60,000 sports cars or yachts or go sky diving or bull-fighting, etc. And the world—-more importantly their wives—seem to just shrug and say oh he’s just having his mid-life crisis. This seems to me incredibly wasteful and impractical. I have told my wonderful (patient) wife, my priorities are a little different. I’ll save us money on my mid-life crisis. Instead of dropping $60,000 on a sports car I likely won’t fit in anyway (those things aren’t built for guys who are my size) or $50,000 on hospital bills (nope, I don’t want to jump out of a perfectly good airplane, thanks very much), I’ll spend maybe $3,000 on a very nice telescope and never buy another one. At most, I’ll build a small little observatory/shack in which to house said telescope. But that’s iffy, depending on where we live at the time and how much yard space is available. 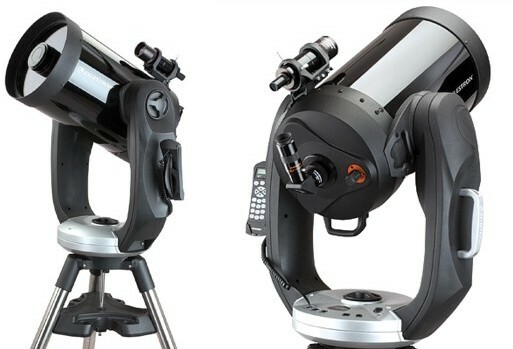 Celestron’s 11″ SCT telescope, with a computerized fork mount. Reviews have this as one of the best in the business. Hey, I guy can dream, right? Hello, We just bought a Bushnell Skychief I telescope and it doesn’t have an eyepiece. We ordered a Meade Plossel 1.25″ but it was too big. I did some reading and learned that I would need a .965 eyepiece, which is both hard to find and, from what I read, not as good as a 1.25 eyepiece. I see you have an adapter for a 1.25 eyepiece – what kind of adapter should I buy and would you recommend a Mead Plossel eyepiece? Thanks so much! First off, I feel your pain about the .965 eyepieces. The star diagonal adapter I have is actually home made. I took the 90 star diagonal that fits my .965 scope and a 2 liter soda bottle. I cut out a strip of the plastic from the empty bottle just wide enough to fit the base of one my 1.25″ eyepieces that I use most often (I don’t have them in front of me at the moment, but I think it was a 9mm Zhummel Plossel). I wrapped the plastic strip around the base of the eyepiece twice to make it decently thick, then wrapped the whole thing in duct tape. Yeah. Duct tape. Once I had the plastic wrapped and taped around the eyepiece, I carefully pulled out the eyepiece and test fit the hollow tube on the eyepiece end of my star diagonal (being careful to remove the set screw first). There was something like a 1/16″ or 1/8″ gap. So I cut thin strips of duct tape and wrapped it around the eyepiece holder on the right angle piece until I could slide the 1.25″ holder over it and make a snug fit. 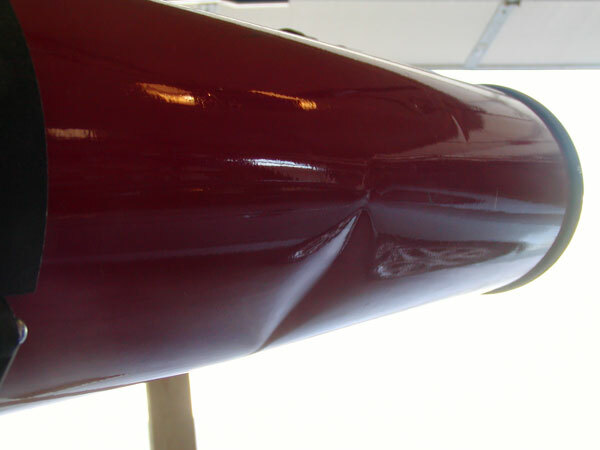 Once that happened, I wrapped the seam in more duct tape–yeah, it’s ugly as sin, but it gets the job done). I’ll say one thing, it works, but it’s crude. If you want to spend money (obviously I didn’t LOL) you can go out and buy this one from Agena Astroproducts. I’m sure there’s others out there, this was the first one that popped up on my search. As for the Meade Plossel, I think it’s just fine. I’ve looked through a few and the bigger factor would be if it’s the metal and glass or plastic one. I’ve seen the plastic ones that came with my 70mm Meade “toy” scope that worked, but the ones made of metal and glass are just fine. I’d say they’re about the same as my Zhummel Plossels (which came with my dob). If it gives you decent views (after you make/buy an adapter) and you can see things you never would have seen before, I’d be happy! Hope that helps and thanks again for stopping by! Thank you so much for your prompt reply. We ordered the adapter and a 1.25″ lens from Agena this morning. This is very exciting. We’ve wanted a telescope for a long time. Then this one came along at a thrift shop and we’re so glad to have it. You saved us a lot of time trying to figure out what to do about the eyepiece!